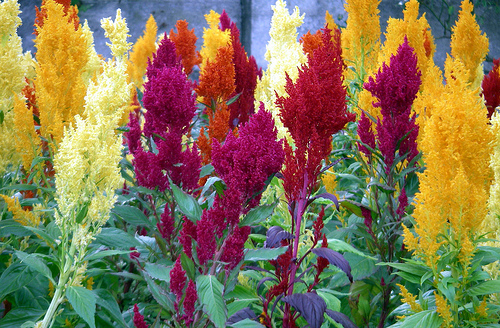 Cockscomb (or properly “Celosia cristata”) is an ornamental—and edible—genus of the Amaranth family. Around the world members of the Amarath family are used as leaf vegetables and pseudo-cereals. In some parts of the world they are even considered weeds. 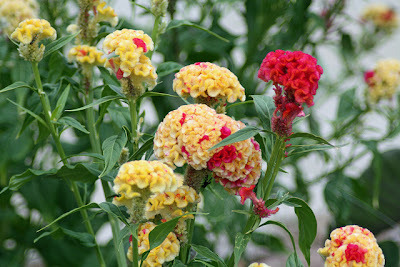 Celosia is used as a treatment for intestinal worms (particularly tapeworm), blood diseases, mouth sores, eye problems. The seeds treat chest complaints and the flowers treat diarrhea. The leaves are used as dressings for boils and sores, and the boiled vegetables are said to be slightly diuretic. Celosia is grown as food in equatorial areas around the world such as Mexico and the Caribbean, Northern Africa, India, South East Asia, etc. It is one of the main leafy vegetables in Nigeria. 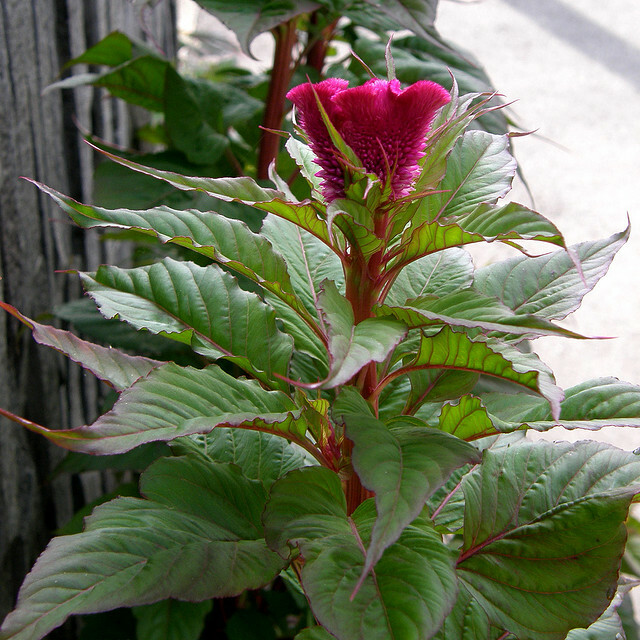 Leaves, as well as stems and young flowers, have a mildly spinach flavour and are used in stews and other dishes. Cockscomb is famous for it’s very ornamental flowers, which form wrinkly masses that resemble the comb on a rooster’s head, from where it derives its common name. The plants flower in an almost unreal variety of colours and have become more popular over recent years. They are actually an annual, but some things deserve to the effort of being replanted each year. This means that although they will go to seed, those seeds cannot withstand our winters in Zone 5-6 and do not come up as new plants in the Spring. 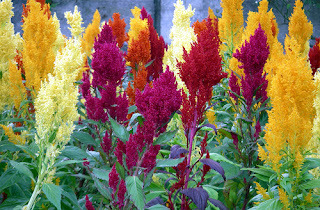 Two varieties I would recommend are the Celosia cristata (THE Cockscomb) and the true wild version, Celosia spicata. Cockscomb grows to a height of about 12” while the species variety can reach heights of 2 to 2 1/2 feet. There’s no rule that says you cannot harvest your own seeds in Autumn and replant. Celosias are good seed producers, but I can’t find information on viability, but you should have results if you plant many. One can always weed out if too many come up. But how often does that happen. 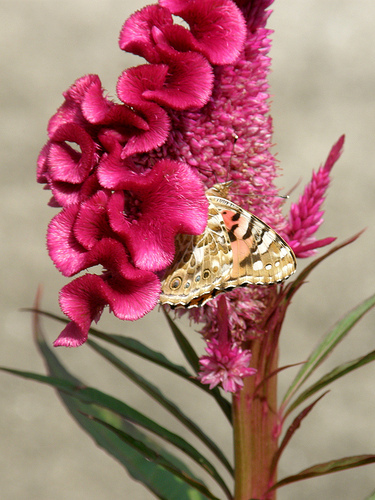 Celosia seeds can be purchased at garden centres (which are starting to open now), as well as the famous (and excellent) Chiltern Seeds in the UK. I’ve said it before, but I cannot recommend them highly enough. If you want something unusual (or “normal”) for in your garden, go to their site and/or order their catalogue. It’s well worth it to have to dream through the Autumn and Winter dreary months. http://www.chilternseeds.co.uk/ Go now!